With Black History Month right around the corner, and New Year’s resolutions in the distant past, I thought of no better time than now to pay tribute to one of my favorite black inventors, George Washington Carver, with a healthy, nostalgic smoothie. So, in honor of Mr. Carver (does that mean his first name was George Washington? 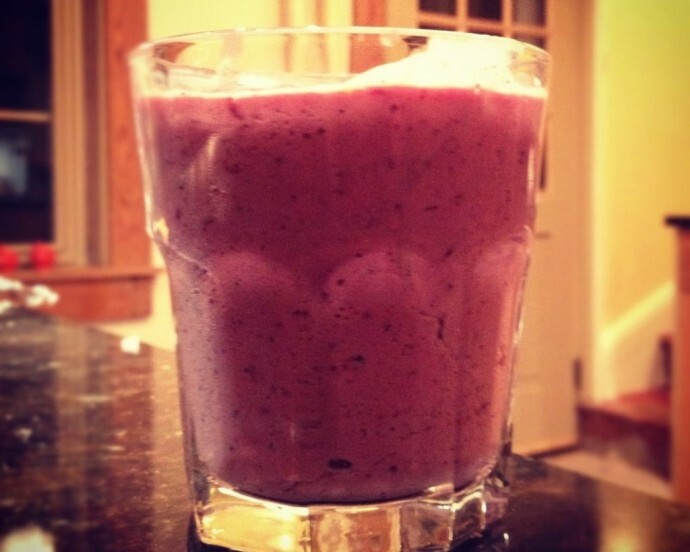 ), I whipped up this healthy, protein-rich smoothie after my morning workout. Instantly, my mind took me back to grade school lunches of peanut butter and Smuckers jelly sandwiches on white bread with the crusts cut off – too bad my mom didn’t actually let us have white bread, or cut off the crusts to our sandwiches, but it’s a happy thought. The inspiration for this smoothie came from the smoothie shop at my gym. So what if I ordered it from the kids menu? Put berries, peanut butter, milk and protein powder into food processor, blender or bullet and puree for at least 2 minutes until smooth. If the consistency is too runny, add ice until it is the consistency you like. They key is blending the smoothie for a long enough time so that it is smooth and evenly flavored. Alexia Detweiler is a freelance food blogger living in Lancaster, PA with her new husband and two little dogs, Charlotte and Cinder.